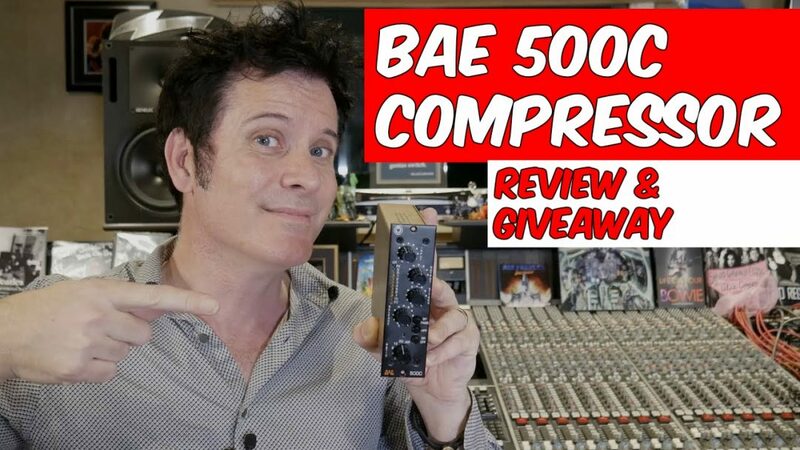 The BAE 500C is a FET style compressor that is reminiscent of the FET compressors you know and love from the 60’s and 70’s, but in a lovely 500 series rack format! As many of you know, I am a huge proponent of 500 series gear because of the flexibility that it gives you as a producer. Simply load up your lunchbox with your favorite, preamps, EQ’s and compressors and use them in your studio and when you find yourself at another studio or gig, pick it up and take it with you! This compressor sounds fantastic! For the review we use the same song that we used for the Phoenix Audio compressor and ran a drum loop, a pair of guitars, a bass guitar and a vocal through it and it sounded great on them all! There are 2 note-able features that I found really useful when using on this compressor. Firstly, the compressor has a high pass filter that allows you to let the low end through and only compresses the signal above the high pass filter. This is great if you want to keep that low end energy from creating a pumping effect on your source material. Second, the compressor allows you to keep the detector circuit in bypass while still letting signal pass through the unit. This is great for adding a little analog mojo to your track by making use of the transformers in the 500C. BAE was kind enough to give us one of these to try and we are going to give it away to you! Please watch the review above and then enter the giveaway! Remember, the more actions you take the high you increase you chances of winning!